DOT Secretary Ray LaHood announced on April 22 the availability of $474 million for a fifth round of the Transportation Investment Generating Economic Recovery (TIGER) competitive grant program to fund surface transportation projects that "have a significant impact on the nation, a region or metropolitan area." Projects eligible for TIGER grants include public transportation, passenger and freight rail transportation, highways and bridges, and marine port infrastructure investments. Grants range in size from $10 million to $200 million. The FY 2013 Appropriations Act requires that TIGER funds be obligated before Oct. 1, 2014. DOT will give priority to projects that are ready to proceed quickly. Applications are due June 3. Click here for additional details. Yesterday, Peter Varga, CEO of The Rapid in Grand Rapids, MI, and APTA vice chair, testified before the House Transportation and Infrastructure Subcommittee on Highways and Transit on state and local perspectives on implementation of MAP-21. He addressed many issues advanced in MAP-21 such as asset management, state of good repair, performance management, transit safety, and New Starts and project streamlining. Varga also addressed the concerns of APTA members over changes to the Bus and Bus Facilities program and its funding. Members of the subcommittee also engaged the witnesses, representing various stakeholder groups, on industry views on the future funding of federal surface transportation programs. The members of the Massachusetts Bay Transportation Authority's (MBTA) SWAT team, who risked their lives to apprehend the Boston Marathon bombing suspect, were featured in an interview with Anderson Cooper. During the shootout, Officer Richard Donahue was seriously wounded. The MBTA has established a fund to collect donations. Donahue is married and the father of a 7-month-old son. He has been a member of the MBTA Transit Police Department for three years. In the wake of the Boston Marathon bombings, APTA President & CEO Michael Melaniphy released a statement calling for increased investment in transit security. "During the last several federal budget cycles, the American Public Transportation Association has urged Congress to significantly increase funding for public transportation security," he said. "Past appropriations have not come close to the levels called for in the Implementing Recommendations of the 9/11 Commission Act of 2007, which established a unique federal public transportation security program within the U.S. Department of Homeland Security." Melaniphy noted that from 2010 to 2012, federal investment in transit security decreased by 65 percent, while public transportation ridership increased by 300 million trips. Separately, Canadian authorities on April 22 arrested two men on terrorism-related charges that, according to U.S. officials, would have involved attacking a VIA Rail train route between Toronto to New York via Niagara Falls and Buffalo. 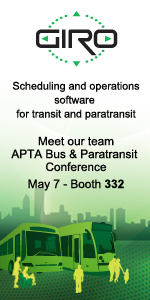 FTA Administrator Peter M. Rogoff will join APTA's Bus & Paratransit Conference Opening General Session on Sunday, May 5, in Indianapolis. He will participate in a panel discussion and will talk about FTA's role and responsibility in the aftermath of Hurricane Sandy. Rogoff will also host a session on Monday, May 6, from 7-8 a.m. where he will focus on MAP-21 safety initaitives. Earlier this week, FTA released a proposed circular for the urban formula program. The proposed revisions reflect changes made to the program under MAP-21. More details are available on FTA's website. Additional information on commenting can be found through the Notice of Availability of Proposed Circular and Request for Comments. There is still time to register for APTA's 2013 Rail Conference, June 2-5 in Philadelphia, PA. The many workshops and technical sessions will cover timely issues on such areas as operations, technology, safety, security, planning, finance, capital projects, and the technical aspects of providing all modes of rail service: urban, commuter, high-speed, and intercity. This conference also features the industry’s premier product and services showcase. Click here to register. Several APTA members are highlighted in a USA TODAY feature for their efforts to "go greener" by using environmentally friendly buses or alternative fuels. The New York Metropolitan Transportation Authority created a series of videos of children thanking people for taking public transportation on Earth Day. DOT Secretary Ray LaHood, in his Fastlane blog, says multimodal transportation centers are helping to revitalize downtown areas and cites the grand reopening of Seattle's King Street Station as an example.